kochi - If you didn’t like the end of Kochi. If you didn’t like the end of Kochi. So this afternoon, a comment came in for the final page of Kochi. Actually a few people have been a little incredulous with how Kochi ends, so I wanted to reply. In fact, I’ll give you three (possible) replies. 1) Hey, you got a whole book to read for free. It can end how it wants. 2) The ending of Kochi is right and fits the book’s underlying message. I have said Kochi is to be interpreted by the reader. That then leaves the ending to be interpreted in a number of different ways, depending on how you’ve read the book and what you think it means, so if it’s left you cold perhaps it requires some thinking. I don’t want to spell it out, so I’m not going to detail it. I will, one day, write out some of the ideas I was trying to weave underneath Kochi. But I’m not going to spoon feed you what it all means, never. 3) It’s not the end anyway, it’s the prologue. 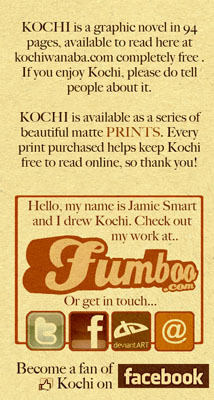 Is this the end of the Kochi story? No. It was never intended to be. This book was meant to stand alone as a tale in itself, with its own message and subtexts, and I’m proud that it does. It is self-contained. But when I was writing this first book, I was also planning out the rest of the story, it continues where it left off and gets a lot more mental than this. Whether I’ll ever get the time or opportunity to do it justice, I don’t know. ALL comments are really appreciated, the feedback has been really humbling. Thank you! Well the highlight of a very long and tedious day at college is knowing that Kochi will be back. I am quite excited!! I stumbled across your comic just a few days ago. I’m not even sure I remember HOW I found it, seems like it was just an absent minded click and I was here. But I’m sure glad I did. I actually gasped out loud at several points. It takes something special to invoke that kind of reaction from me. Totally engrossing. I hadn’t the faintest idea where it would all end up. When I finally reached the end, it just clicked. Everything fell into place. As far as this story is concerned, it was perfect. You can be sure I’ll be studying the pages of Kochi closely. I’m making my first foray into graphic novels myself, and such solid storytelling is certainly something to aspire to. Thanks for a heck of an experience.